These might be the only pictures in existence of two Tower top intruders. They were sent in by Maggie Valentine, of Northampton, who took the photos while on holiday in Blackpool, on September 11, 2002. She was the only person close enough to capture the images of the two men, as they climbed right to the top to Blackpool Tower – to make a protest about American rights. 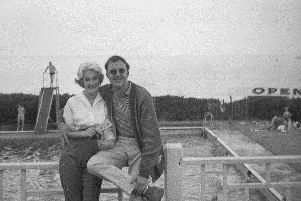 Maggie said: “I followed these two men up to the top of the Tower, in the first lift of the day and then up the staircase as far as you can go. “As soon as we got there, one of the men cut through the rope netting and climbed through to position himself – as can be seen on the photos – on the outside of the meeting. “I thought he was going to throw himself off, but he quickly unwound some stars and stripes bunting and stared shouting about it being one year since 9/11 and about the rights of American people – although I can remember exactly what he was saying. “It caused havoc along Blackpool seafront – the place was a mass of police, fie engines and other emergency services. “The lifts and all Tower access was closed off and we were stuck up there, while the police came and talked him into coming back into the building. He was promptly arrested and taken away. Over the years, there have been several instances of daredevils taking their lives in their hands by illegally and dangerously climbing the Tower. In 2004, two men parachuted off Blackpool Tower, after using bolt cutters to snip through the safety net. And in an almost identical incident, two men risked their lives to parachute off the 518ft iconic structure in 2006 – once again cutting through the safety netting. They jumped into a car on the Promenade but police caught up with them shortly afterwards. In 2009, a daredevil duo posted on the website 28 Days Later, boasting about their exploits of scaling the Tower at midnight. They posted photos of their feat and revealed they had been planning the stint for more than two years.